This was the less exciting of the two robots types we saw (and they had a couple of each.) There was also these enormous CNC Mills going on, but there were people working near them, and I didn't ask if I was allowed to take pictures. After walking past all the machines we walked past the slabs, row after row after row, of large slabs of granite, and marble. Which brought us to Black Galaxy Colour Lots 7 and 8. 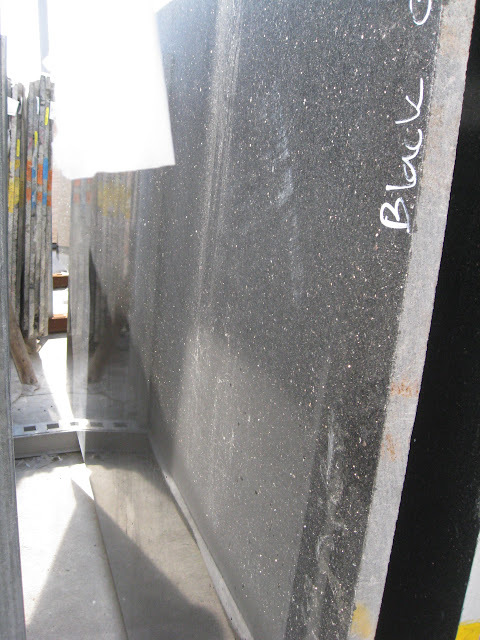 So you don't get to actually pick your slab, and in fact you don't even get to see a whole slab (the rows are just too tight) but you get to pick from a slab lot, as each slab lot is a slice of the same stone, so imperfections and colouring tend to be consistent. After granite it was back to the house to finish the days work, and then we did the house visit of the day. The brick is basically done, the bricker was just finishing the last row above the door when we left. I imagine the siding will go up next week, sometimes they work weekends sometimes they don't so who knows what to expect, but it looks great. The insides are coming together, they started work on the main floor and seem almost done upstairs. The tub was installed, and for some reason I didn't take a picture, but whatever they won't uninstall it. Here is what I call the cat niche, technically it is for art, but cats are art right? Now it is 8+ feet off the ground, you would think cats couldn't get up there... I have faith in there ability to get where they don't belong.